A 75-count can of whoopass. The usual: AK47 clone with Aimpoint micro on an Ultimak rail. Still works. The shooter is a professor of Renaissance literature and a professional MMA fighter in real life. 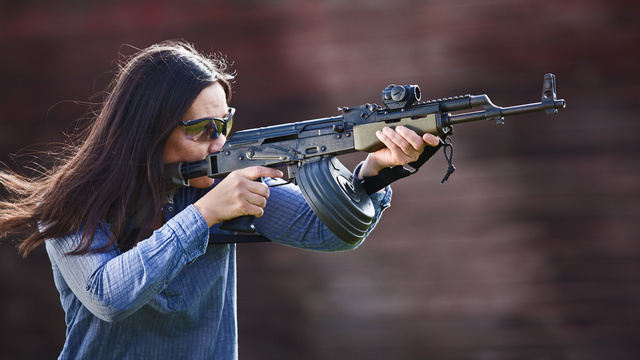 This entry was posted in interesting people, rifle and tagged 7.62x39, AK47, optics, red dot, woman. Bookmark the permalink. 5 Responses to A 75-count can of whoopass. Where was she when I was getting my English degree? I wonder how many rounds you can fire at a decent rate before the AK’s forend catches on fire?